Remember way back when I told you I’d ordered lisianthus in a combination that had blue, yellow and green blooms? Well today the first of the flowers opened, and whether by nature’s design or mere coincidence it was one in my favorite garden color — blue! 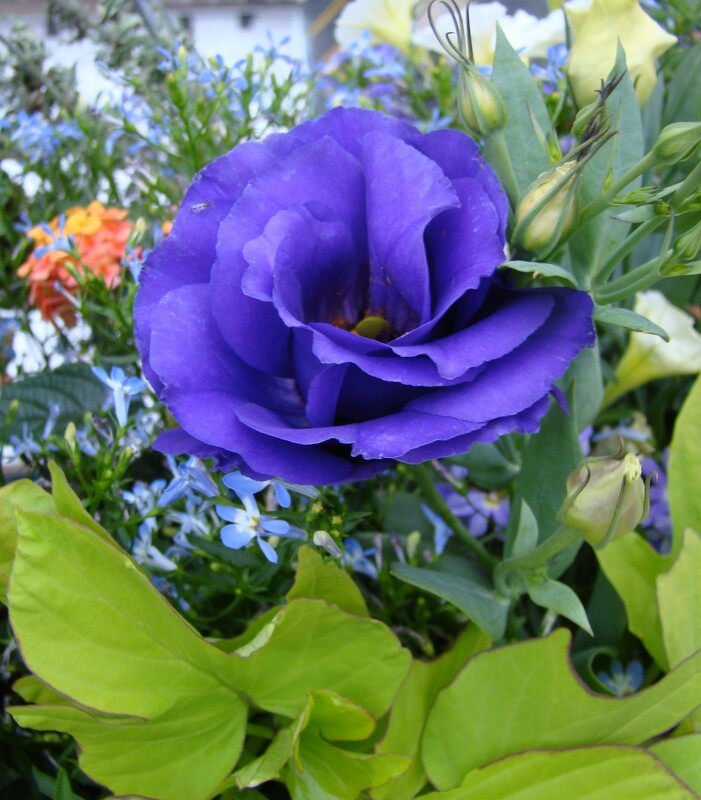 This new development in the garden is shown in the first photo above: The rose-like purple-blue lisianthus is surrounded by a delicate bed of light blue lobelia and unopened lisianthus buds (yellow? green? ), a red-orange cluster of lantana, and of course, the chartreuse leaves of my sweet potato vine. So now I’m hoping that Mother Nature will tag an extra month onto summer so I can appreciate the full bloom and beauty of her many gifts struggling to come into their own in my balcony garden. You have made me speechless today. These two blooms are what I would like to have in my garden! I love these rose-like-purple blue flower and the green zinnia… they are awesome! Btw, I can see your sweet potato vine is happily settled outside 🙂 The leaves go very well with the flowers you have. Good job! Stephanie: I believe I read on My Little Vegetable Garden that they grow zinnia, so you should be able to also. Oh, and btw, that’s not the sweet potato vine I grew myself, that’s the one I bought at the nursery. The one I grew has leaves that are darker green. What color are the leaves on yours? Oh I see. Yes we can grow zinnia here but I have not seen a green one yet. Oh man, isn’t that the truth–mother nature is in control! For instance, this huge wind storm we had knocked over a couple of container plants that plunged from our balcony to their death! Oy! You captured some beautiful pictures of your blossoms! I’m sorry to hear about your casualties! What did you lose? Hi Avis. I’ve just been catching up on what’s been going on whilst I’ve been on my holidays. Lovely blue flowers in the post further down, and I love your lime green Zinnia. When I took my allotment on in March of this year, I was wondering how I would go about providing enough water for my plants, as our allotment site doesn’t provide mains water. The met office had predicted a long hot summer, but I needn’t have worried as I’ve coped perfectly well. The met office got it wrong (once again) and we seem to have nothing but rain. Still, it saves me watering I suppose! Oh my gosh, those are drop-dead gorgeous blooms, and fabulous photos. Worth the wait! I’m hoping right along with you we have a late frost. Last year in the south burbs there was no frost until mid-November. It was awesome. 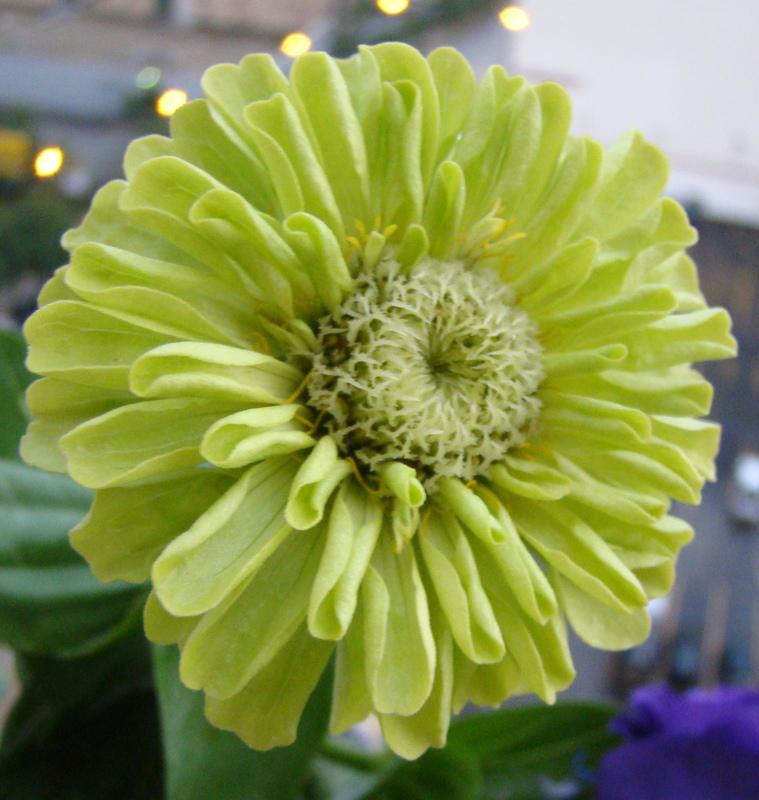 Is that Zinnia ‘Green Envy?’ It is my favorite of all the Zinnias I’ve ever grown. The zinnia is indeed “envy.” Originally, when I started my first seeds I planted “tequila lime,” which is very similar in color. But, the seeds didn’t make it so I bought the “envy” seeds from Home Depot and started those a little late. It is lovely, and very hearty it seems. gorgeous. sorry i missed the garden this summer. any shots from the street?